Recently PSL added one of my favorite things, which is a Strong Testosterone blend! Both are long esters, so it's kind of like a Sustanon style, but long lasting, so that you can do two, or even one shot a week, and still be on point with your dosage (since its active life is over 2 weeks in duration). 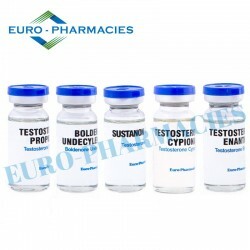 So I decided to get it due to the fact that I wanted a stronger Testosterone, a long acting ester, and something I good get over 1000mg with not a huge amount of volume. The other great thing is your activating different receptors, and I yielded better results than when compared to one single Testosterone. I saw a big leap in weight and strength with this blend, and I'm using it all the way through a 20 week. I am at 18 pounds heavier than start weight, and my squats and deads are becoming pretty easy with the weight that I have been using in my routines. With either of these esters it's recommended to be used at 250-100 mg per week , but I say if you are going with a blend may as well go on the higher end and get more results out of it. I don't bloat too much with this stack, and don't really notice bad sides. The inject is very smooth and consistent. Thanks guys for this blend!